Nondenominational Christian Churches terrify me. In many ways, Ms. Eddy was right to appoint the Bible and Science & Health the “only preachers” to avoid the “cult of personality” that can grow up around charismatic religious leaders. In “organized” religions there is usually some hierarchy, board, counsel or group that helps steer the thoughts and teachings of the movement: Baptist teachings are similar at both in white and African American congregations. Catholic services vary little regardless of geographical location as well. Christian Science services are the same, everywhere (the language may be different, but the sermon is the same). Nondenominational Christian Churches have no such restrictions which enable their pastors, ministers, and church leaders to espouse whatever crazy ideas they glean from the pages of the Good Book. 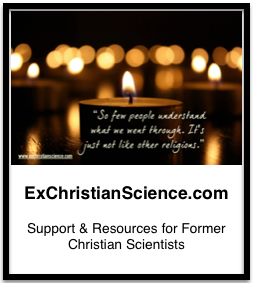 For a time after I left Christian Science I considered myself to be “generically Christian” – I celebrated all the important “Christian” holidays: Christmas, Easter, Thanksgiving, the 4th of July (oh right, our founding father’s weren’t Christian), Halloween… Then I started reading the Bible, and thinking about it. No amount of praying and reading made things better, it only pushed me farther away from the “Christian” label. I want from wanting to reform CS to wanting to get as far away from it all as possible. I’m still trying to figure out what I believe, but I know I don’t feel the same way as many of the other groups who identify as “Christian,” non-denominational or otherwise. I think it is time for us to go beyond Christianity, beyond Christian Science, and abandon the dogmas and language associated with it. Some people are going to try and argue that Christian Science should be an exception because it is “based on the inspired word” of the Bible. Inspired or not, the Bible has been used to justify some pretty horrible stuff over the years, and while it is a great piece of literature and loosely based on some historical facts, it should NOT be used as the foundation of our society. I am not calling for a “godless” or “immoral” society, instead I am calling on one that fosters RESPECT for our fellow man (NOT the homophobic, misogynistic, anti-intellectual, authoritarian rantings of the Abrahamic God and his followers). Perhaps a little kindness towards others. A little less fundamentalism and a little more fun, love and charity. *I’m intentionally linking to news and 3d party sites for this information, I can not bring myself to send these individuals and organizations any further traffic.